At this time and age, it is very difficult to achieve anything meaningful without international cooperation. It is just the way the world works now. 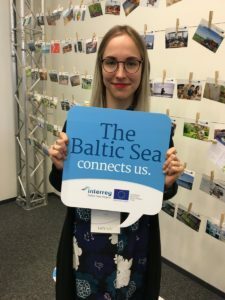 This was very concretely and beautifully demonstrated at our funding body’s, Interreg Baltic Sea Region’s Conference in the beginning of April. 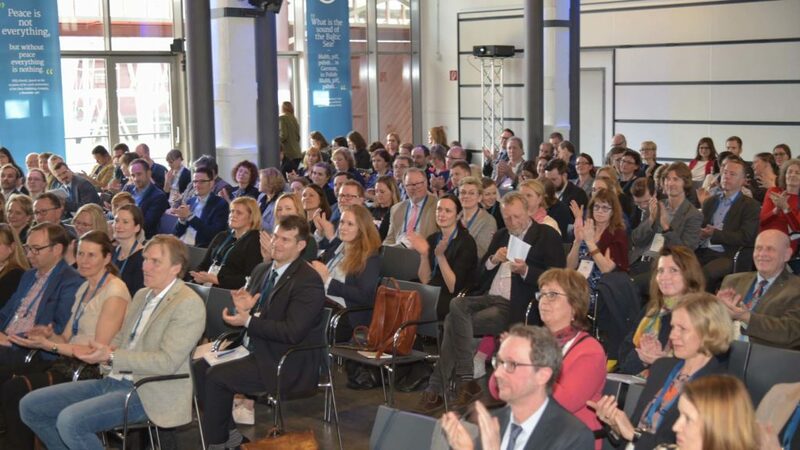 111 projects around the Baltic Sea were invited to share achievements, celebrate results and share lessons learned in sunny Lübeck. 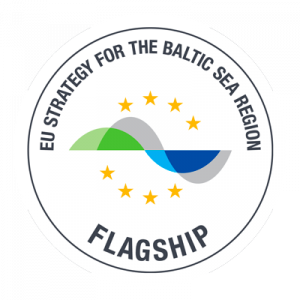 Each of the projects, transnational in nature and ambitious in spirit, are connected via the goal to create a Baltic Sea region where life and work is clean, healthy, and safe. My personal favourite, ECOPRODIGI, was invited to pitch on our achievements. I was happy to find our pitch within the ‘Digitalisation’ session together with four other projects which had nothing to do with maritime industry nor eco-efficiency, as it meant that I was able to share something completely different and learn from others. 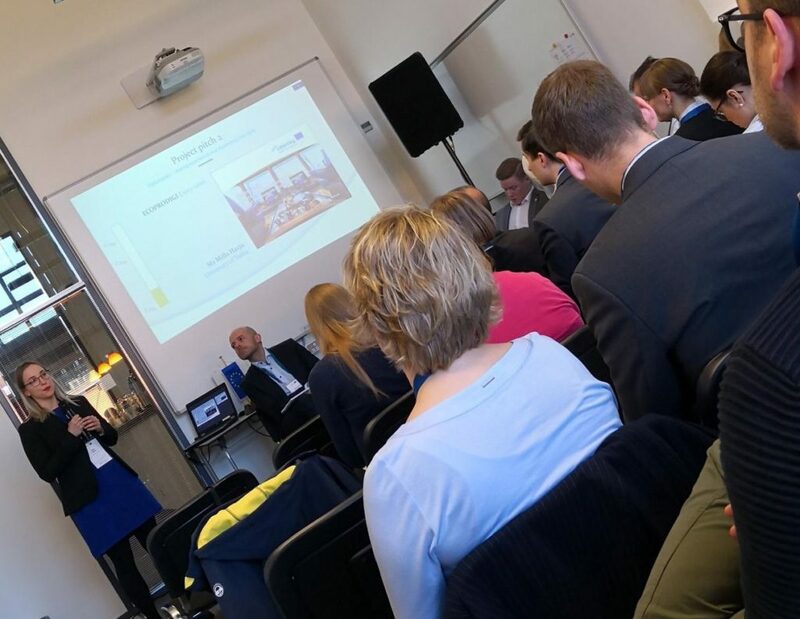 The pitching session consisted of 5-minute pitches from each of the projects, together with a 10-minute ‘roast’ from an expert panel that included members of the Interreg BSR Monitoring Committee and colleagues from other projects. “Digitalisation provides tools to save the Baltic Sea”, I started, because I believe it is true. In ECOPRODIGI we are developing solutions – digital tools – which will provide maritime industry with more eco-efficient processes. And when I talk about eco-efficiency, I talk about processes which are both ecologically viable and economically feasible. Ultimately, they will cut down emissions, reduce waste and energy consumption. This all will save human resources, enabling more meaningful work for many and a possibility to use our human mind for issues that need creativity and consideration which is not provided by AI – at least not yet! These solutions will be tested and piloted in 5 countries across the Baltic Sea Region. The transnational nature of this project is absolutely crucial, seeing that the problems within the industry and in the sea connect us all, and we can only reach meaningful results by working together. It is a fact that digital technologies will revolutionise processes and work in every industry over the coming years, but also provide revolutionary solutions for increasing eco-efficiency. And how do we intend to harness that revolution? With education. Indeed a major part of our project is to develop educational content and training packages, which the businesses and perhaps the maritime institutions can use to make sure that all the solutions that are being developed are also properly and correctly implemented. This will also act as the seedbed for future development, as you and me know very well that the digital tools can expire very quickly – just think how quickly we are moving on from 3G to 5G – therefore we want to create a space to maintain the project’s results even after 2020. In addition, we are very keen on opening and maintaining discussion at the policy level; this is why one of our work packages concentrates on organising policy seminars and conferences, and preparing policy briefings and recommendations to ensure that the policy makers in Brussels are aware, and on the same page with the maritime industry in regard to the progress, potential and development enabled by digitalisation. Our next policy seminar will be in fact held in Turku, Finland on the 21st of May – read more and register soon here! Perhaps the most remarkable aspect about our project, and the one that seemed to impress my colleagues the most, is the fact that half of our 21 partners are businesses. This heavy business involvement means that we have the end-users involved from the very beginning of the project, which means that the bottlenecks which we are solving in the project, come directly from the people involved in the day-to-day operations. Also, since the business is involved, they are expecting to see concrete solutions implemented; this works for us just fine, as it means that once our project is finished in 2020, there will already be ships sailing on the Baltic Sea with our solutions on-board!